Ask Verified: How Can I Effectively Promote My Audit? La Ola Latino-Americana is a broadsheet newspaper based in Indianapolis, Indiana. It is printed every two weeks, and it is distributed free of charge in about 200 Hispanic businesses in Indianapolis and its metropolitan area. La Ola is the most widely read bilingual newspaper in central Indiana. No other publication�Hispanic or Anglo�in central Indiana reaches as many Hispanic readers as La Ola Latino-Americana. The Michigan Chronicle is the state's oldest and most respected African-American newspaper. Founded in April 1936 by Lucius Harper, The Michigan Chronicle is not only a newspaper, but is also a productive business that participates and contributes to many worthy projects. The Michigan FrontPage is a contemporary, magazine-style "weekend" newspaper designated to cultivate and be the public face of progressive urban image and lifestyle choice for a targeted demographic profile that reaches the young corporate professional, entrepreneurs, athletes and the influential movers and shakers between the ages of 25 and 40 in metro Detroit. The FrontPage fuses fashion, beauty, music, art, entertainment, and politics together while still covering mainstream news and content missed in mass media. Luxury Las Vegas is a monthly, high-end, lifestyle magazine dedicated to the pursuit of "Extraordinary Living for Extraordinary Lives." The primary goal of the magazine is to appeal to the consumer as well as suppliers, vendors and advertisers that provide the high-end products that are showcased in the magazine. Luxury Las Vegas connotes a tone of elegance that is apparent throughout the design of the entire magazine through exceptional photography, writing and layout. 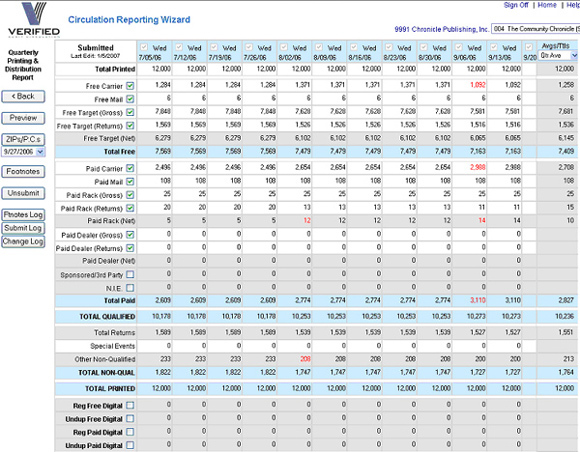 Verified is pleased to announce the release of the enhanced online reporting Web Wizard this month. The latest version offers new features to make reporting easier and more efficient. Verified is always searching for ways to enhance the user experience. Publishers already have a lot to take care of. Reporting to Verified should not unnecessarily add to that load. A number of key improvements make the Wizard more functional and intuitive. Months of development and testing went into the new version. Verified listened to user feedback and incorporated many suggestions into the latest Wizard. The new Wizard has enhanced visuals, "roll-over" help, easier navigation and increased speed. One of the most important improvements is the addition of Digital Edition reporting. Now users can report their digital circulation as easily as reporting print. The Wizard interfaces smoothly with most major browsers including Internet Explorer, Firefox, Safari and Netscape. Those already familiar with the previous version will have no problem switching to the newest Wizard. 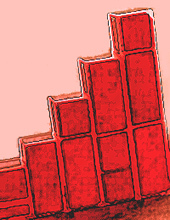 Despite falling circulation numbers, most newspaper publishers are planning to raise their advertising rates in 2007. This year, even modest increases will be met with strong resistance from most advertisers, especially national advertisers. In fact, those advertisers are looking for decreases, not increases. Analysts predict newspaper increases will average 3 to 6 percent for 2007. "Historically, they generally come out with a 3 to 5 or 6 percent increase," says Bob Shamberg, chief executive officer of Newspaper Services of America. He notes that the bulk of newspaper advertising agreements are renegotiated during the winter months, typically in the first quarter. "Our sense going into it is that newspapers will attempt to get higher rates, even those losing circulation." Newspapers are no longer the only game in town. Mike Monroe, Vice President of Media and Advertising Operations at Macy's says media budgets are being more carefully scrutinized and advertisers will be more likely to consider other media options. "We don't want to pay more for less. We're certainly going to try negotiating rates," said Monroe. "We take a lot of factors into the rates we are willing to pay." But many newspapers are hard-pressed to keep rates flat. "Newspapers are just facing so many challenges right now that they are seeing what they can get out of advertisers," said Randy Craig, the publications editor at Inland Press Association. "I don't think it's greed�they are just trying to survive." Len Kubas, president of Kubas Consultants, a management consulting firm based in Toronto that assists newspapers in generating more profitable advertising revenues, says, "Newspaper revenue comes from contract advertisers that have negotiated rates much like television, radio, and the Internet." "You cannot count anymore on what's published in the rate card to deliver the increase," said Kubas. "If a newspaper says it's going to increase advertising 3 percent irrespective of circulation, that doesn't necessarily mean that everyone is going to pay a 3 percent increase." Publishers exchange pop-up subscription ads instead of offering their own publication when visitors arrive at their sites. It's a deal similar to a list exchange, enabling each site to advertise on the partner's site. This can generate revenue from its existing subscribers and visitors. It also keeps the sites fresh. Business-to-business publishers use a rotating primary picture to lure visitors deeper into the site so that they can draw them into their own subscription offer. The site circulates three or four primary pictures with some short teaser copy, and each picture relates to a story inside the issue. When a visitor clicks on the picture, it takes them to the story. It can be more effective than a single photo. Several publishers are making their paid content available free for one day only, sometimes "sponsored" by a third party or advertiser. This can bring in both sponsorship revenue from the advertiser and site traffic if the advertiser promotes the "One-Day Free Pass" on their own website. This strategy can help a publisher capture permission email addresses so that they can send promotional offers to the visitor later. ABM Thought Leadership Breakfast Series � One Team. The 17 million empty nesters in the 87 markets surveyed regularly by The Media Audit are 45 or older and very affluent, indexing about 100 points above the market average of 100 in almost every income category beyond $50,000. Bob Jordan, president of International Demographics, Inc., notes, "The media habits of the affluent empty nesters are dominated by newspapers and the Internet." According to the report, more than 27 percent spend an hour or more each day reading a newspaper (index 159) and 38.7 percent spend 430 minutes or more each week on the Internet (index 107). Radio, television and direct mail all index at less than 100 with the affluent empty nesters. Almost one-fifth of the people who plan on spending more than $30,000 for their next automobile are affluent empty nesters, 50 percent more than the average. And those who ate out at least four times during the last two weeks (at a sit-down restaurant) also index at 152. 20.1% (index 114) made 12 or more purchases on the Internet. 33.6% (index 100) spend $150 or more there. "The empty nesters are another example of the enormous impact the presence or absence of children has on almost all household expenditures," says Jordan. 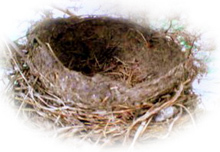 The number of affluent empty nesters varies greatly within the 87 markets surveyed by The Media Audit. The average number of affluent empty nesters for all markets surveyed is 12.5 percent, though individual markets vary widely�from almost 19 percent of the households in the Fort Myers-Naples market to 8.9 percent in Buffalo. Just 24 percent of affluent empty nesters are 65 years old or older, 38.7 percent are between 45 and 54, and 37.3 percent are 55 to 64. Once your audit is completed, the most important part of the audit process begins. Make sure you promote that you are audited. Use the most current Verified logo in each issue and on all marketing materials. When advertising agencies and advertisers don't see the logo, they may assume you are not audited. Make sure all members of your staff receive a copy of your circulation audit and understand how the information is presented. Your ad sales staff should be prepared to answer questions from clients when they arise. Verified automatically releases your audit to Standard Rate & Data Service and other national media listing firms. If you would like your audit report released to other media firms, please let us know. Verified can provide you with a list of over 14,000 international advertising agencies and 18,000 U.S. advertisers who spend $200,000 or more on advertising. For a list in your area, call 415-461-6006. Use in-house advertisements to promote your audit. Verified can provide you with ads or you can create your own. Use ads to highlight the strengths of your publication such as total circulation, high net readership, or reader demographics.